The O2 Arena in London is one of the most important entertainment hubs in the city. It has come a long way from the days when it was called the Millennium Dome. Now bands and musicians, sportsmen and entertainers come to this small corner of North Greenwich from all over the world to entertain their fans. The area boasts many bars and restaurants, a cinema, night club and exhibition space not to mention the two concert venues – O2 and IndigO2. Encircling the central arena is Entertainment Avenue, a hive of activity stretching as wide and far as London’s New Bond Street. If you’re planning a trip to the O2 Arena, London then to make sure you are able to fully explore the area then it is a good idea to stay nearby as it is not in the most convenient of places. 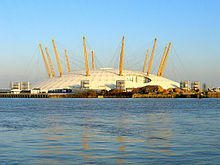 Fortunately there is wide selection of hotels near the O2 Arena to choose from including Novotels, Holiday Inns and Ibis hotels. Many of our packages for events at the O2 Arena come with pre-selected hotels. This is not only to make sure that you have a good choice of hotel but also to make sure that you get great availability at great prices. So we are sorry if there is sometimes no choice of hotel with your O2 Arena event, but we hope it will add to your enjoyment, rather than detract from it. So from Madonna to NBA Global Games, from Muse to Little Mix and Disney On Ice, we hope that, if you are heading to the O2 Arena soon, we can make your London Break one to remember.